Before the next Olympics we will . THE proposition: to turn the USA women's volleyball team from being a no-hope prospect, rated 50th in the world, into Olympic champions. Not possible for mortal man, you might think. And you'd be right - except that for mortal man plus a computer, plus the dedication, staff, time and mpney - it turned out to be very possible indeed. The man was Dr Gideon Ariel, Israeli-born former director of the US Olympic Training Centre, and a fierce champion of hightechnology sports coaching. He took the proposition as a straight scientific experiment, and went about finding a solution - as he explained in a recent radio programme. The first step was to determine what physical and mental characteristics made up the perfect volleyball player. It was eventually agreed after studying miles of footage, that the ideal player would have the speed of the Japanese and the height and flexibility of the Russians. Plus a vital factor - the capacity to adapt one's game to play on the weak points of one's opponents. That having been decided, Dr Ariel's men set out to find the real live girls to fit the brief. Then, of course, they had to learn tactics and techniques, helped of course by Dr Ariel's film-assisted observation of the sport. 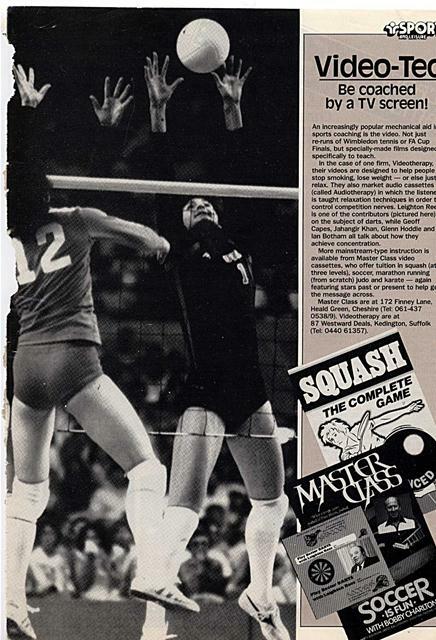 He and his team discovered, for example, that there was more chance of a 'spike' (volleyball's equivalent of the overhead smash) working if the spiker did not bring her arm all the way back before making it. The discovery had instant results; but soon the Japanese had twigged it. 'We found; said Dr Ariel, 'that when we go in to spike with the Japanese, they are looking at our arm and they already know what to do on the court. So we start running probability studies, and we find our girls are 75 per cent of the time spiking to the right, and the Japanese have figured this out. 'So we say we are going to have a strategy, and we carried out the same kind of analysis they use in the Israeli military. When they are going to attack something they want to know what to do if there is an aeroplane or missiles or soldiers there, and the computer will actually give them the information for the least resistant path, for when you are going to invade something you don't want to take the wrong route, and with a computer you can simulate the whole thing. Americans and took the gold. Nevertheless, Dr Ariel's science-sponsored achievements speak for themselves. In just seven years he has created, Frankenstein-like, a worldbeating volleyball team out of a bunch of girls who'd never even played the game before. Now he talks about playing the entire game on holographs, plotting the probably moves of opponents is in any given situation, and playing out the entire Olympics before they even take place. 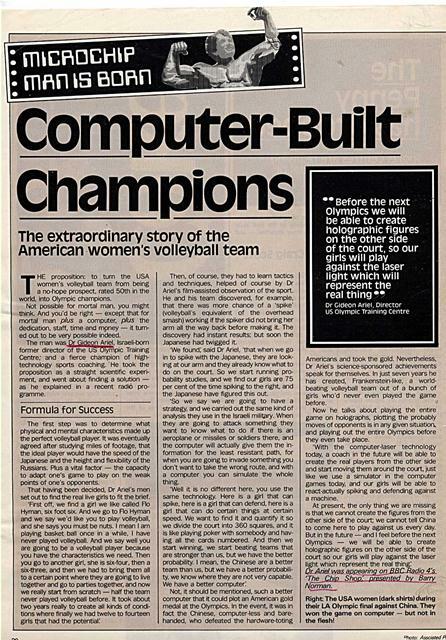 'With the computer-laser technology today, a coach in the future will be able to create the real players from the other side and start moving them around the court, just like we use a simulator in the computer games today, and our girls will be able to react-actually spiking and defending against a machine. Qr Ariel was appearing on BBC. Radio 4 'The ip_ShopL presea.t(2d Barry Norman. Right: The USA women (dark shirts) during their LA Olympic final against China. They won the game on computer - but not in the flesh! An increasingly popular mechanical aid it sports coaching is the video. Not just re-runs of Wimbledon tennis or FA Cup Finals, but specially-made films designed specifically to teach. In the case of one firm, Vldeotherapy, their videos are designed to help people stop smoking, lose weight - or else just relax. They also market audio cassettes (called Audiotherapy) In which the listene Is taught relaxation techniques in order ti control competition nerves. Leighton Ree Is one of the contributors (pictured here) on the subject of darts, while Geoff Capes, Jahangir Khan, Glenn Hoddle and Ian Both am all talk about how they achieve concentration. More mainstream-type instruction is available from Master Class video cassettes, who offer tuition In squash (at three levels), soccer, marathon running (from scratch) judo and karate - again featuring stars past or present to help ge the message across. Master Class are at 172 Finney Lane, Heald Green, Cheshire (Tel: 061-437 0538/9). Vldeotherapy are at 87 Westward Deals, Kedington, Suffolk (Tel: 0440 61357). T ALENT is a very indefinable thing, and most people like it kept that way. 'You've either got it or you haven't' is the standard explanation of success - and that's as far as it goes. Somehow it isn't considered quite respectful to try and dissect a God-given gift like natural ability. And on that basis, the utilisation of man-made machines in order to discover the secrets of that ability is not far removed from the sacrilegious. That being the case, the team of sports scientists at Alsager College would not have lasted long during the Reformation. 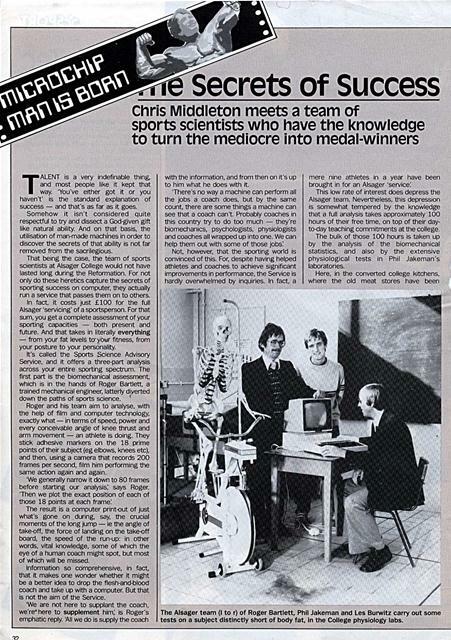 For not only do these heretics capture the secrets of sporting success on computer, they actually run a service that passes them on to others. In fact, it costs just L100 for the full Alsager 'servicing' of a sportsperson. For that sum, you get a complete assessment of your sporting capacities - both present and future. And that takes in literally everything - from your fat levels to- your fitness, from your posture to your personality. Roger and his team aim to analyse, with the help of film and computer technology, exactly what - in terms of speed, power and every conceivable angle of knee thrust and arm movement - an athlete is doing. They stick adhesive markers on the 18 prime points of their subject (eg elbows, knees etc), and then, using a camera that records 200 frames per second, film him performing the same action again and again. The result is a computer print-out of just what's gone on during, say, the crucial moments of the long jump - ie the angle of take-off, the force of landing on the take-off board, the speed of the run-up: in other words, vital knowledge, some of which the eye of a human coach might spot, but most of which will be missed. Information so comprehensive, in fact, that it makes one wonder whether it might be a better idea to drop the flesh-and-blood coach and take up with a computer. But that is not the aim of the Service. with the information, and from then on it's up to him what he does with it. This low rate of interest does depress the Alsager team. Nevertheless, this depression is somewhat tempered by the knowledge that a full analysis takes approximately 100 hours of their free time, on top of their dayto-day teaching commitments at the college. 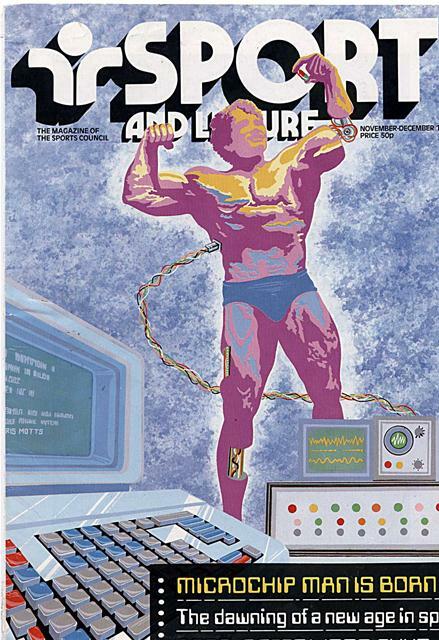 The bulk of those 100 hours is taken up by the analysis of the biomechanical statistics, and also by the extensive physiological tests in Phil Jakeman's laboratories. The Alsager team (I to r) of Roger Bartlett, Phil Jakeman and Les Burwitz carry out some tests on a subject distinctly short of body fat, in the College physiology labs. Generated on 4/20/2019 3:55:58 PM (PST) ADI/HQ/GBA/2019/ARIELCLOUD/v3.0.2018.0126.